Includes mechanical cooling fan, 3.73 axle ratio and wiring harness. Includes vehicle with standard equipment, covered cargo storage, mini overhead console, cargo compartment cover, front and rear floor mats, fog lamps, automatic headlamps, remote keyless entry, rear auxiliary 12V power outlet, Quadra-Trac II on-demand 4WD system, AM/FM stereo, CD player, Cassette deck, 10-disc remote CD changer, 6 Infinity speakers, power 6-way adjustable front seats, security alarm, unique Special Edition badging, body color front/rear fascias and cladding, illuminated sunvisors with vanity mirrors and P225/75R16 outline white letter all season tires. Includes vehicle with standard equipment, 4.7L Power Tech V8 rated at 235 hp @ 4800 rpm and 295 lb-ft @ 3200 rpm, 5-speed automatic transmission, Freedom badge, mini overhead console, rubber front and rear floor mats, bodycolor grille, remote keyless entry, rock protection sill rails, roof rack, cloth high-back bucket seats, P235/65R17 OWL all terrain tires, bright tow hooks, traveler's mini trip computer, vehicle information center, 17" steel spare wheel and 17" x 7.5" gray accent aluminum wheels. Includes vehicle with standard equipment, 4.7L Power Tech V8 rated at 235 hp @ 4800 rpm and 295 lb-ft @ 3200 rpm, 5-speed automatic transmission, covered cargo storage, mini overhead console, cargo compartment cover, front and rear floor mats, fog lamps, automatic headlamps, remote keyless entry, rear auxiliary 12V power outlet, Quadra-Trac II on-demand 4WD system, AM/FM stereo, CD player, Cassette deck, 10-disc remote CD changer, 6 Infinity speakers, power 6-way adjustable front seats, security alarm, unique Special Edition badging, body color front/rear fascias and cladding, illuminated sunvisors with vanity mirrors and P225/75R16 outline white letter all season tires. Includes power sunroof with one-touch express open. Includes class III hitch receiver, 7 pin wiring harness, 3.73 axle ratio and 7 to 4 pin wiring adaptor. Includes vehicle with standard equipment, 4.7L Power Tech V8 rated at 235 hp @ 4800 rpm and 295 lb-ft @ 3200 rpm, 5-speed automatic transmission, Columbia Edition badge, cargo compartment cover, front and rear floor mats, fog lamps, universal garage door opener, automatic headlamps, remote keyless entry, rear auxiliary 12V power outlet, AM/FM stereo, CD player, Cassette Deck, remote 10-disc CD changer, 6 Infinity speakers, roof rack with crossbars, power 6-way adjustable front seats, two tone cloth with logo seat covers, security alarm, dual illuminated sunvisors with vanity mirrors, power sunroof, P235/65R17 OWL all terrain tires, traveler's mini trip computer, vehicle information center and 17" platinum clad aluminum wheels. Includes vehicle with standard equipment, Freedom badge, mini overhead console, rubber front and rear floor mats, bodycolor grille, remote keyless entry, rock protection sill rails, roof rack, cloth high-back bucket seats, P235/65R17 OWL all terrain tires, bright tow hooks, traveler's mini trip computer, vehicle information center, 17" steel spare wheel and 17" x 7.5" gray accent aluminum wheels. Includes AM/FM stereo with cassette, CD, equalizer and CD changer controls. Includes vehicle with standard equipment, 4.7L Power Tech V8 rated at 235 hp @ 4800 rpm and 295 lb-ft @ 3200 rpm, 5-speed automatic transmission and fog lamps. Includes sensors mounted in the valve stem of each tire, including the spare that transmit information to the overhead console. A warning message alerts the driver when the tire pressure exceeds or falls below set thresholds. Includes class IV hitch receiver, 7 pin wiring harness, power steering cooler and 7 to 4 pin wiring adaptor. Include leather trimmed bucket seats, leather wrapped steering wheel with audio control mounted on steering wheel and power sunroof. Includes vehicle with standard equipment, Columbia Edition badge, cargo compartment cover, front and rear floor mats, fog lamps, universal garage door opener, automatic headlamps, remote keyless entry, rear auxiliary 12V power outlet, AM/FM stereo, CD player, Cassette Deck, remote 10-disc CD changer, 6 Infinity speakers, roof rack with crossbars, power 6-way adjustable front seats, two tone cloth with logo seat covers, security alarm, dual illuminated sunvisors with vanity mirrors, power sunroof, P235/65R17 OWL all terrain tires, traveler's mini trip computer, vehicle information center and 17" platinum clad aluminum wheels. Required in CT, MA, ME, NH, RI and VT.
Includes remote keyless entry and mini overhead console. 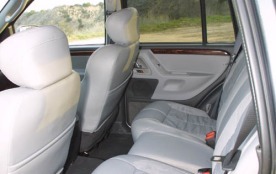 Includes AM/FM stereo with DVD, GPS navigation system and 10-disc CD changer located in center console. Includes skid plates for front suspension, fuel tank, transfer case and frame-mounted tow hooks. Includes front suspension skid plate, fuel tank skid plate, transfer case skid plate, tow hooks, P245/70R16 OWL all-terrain tires and full-size spare tire with matching wheel, heavy-duty high-pressure gas shock absorbers, unique front and rear springs, jounce bumpers, rear spacers, rear sway bar and bushings. Increases ride height by 1 inch.